Carrie is a Design Strategist and User Experience Designer whose work generates excitement. She operates a freelance business, providing services in design strategy and user experience. Carrie is the co-founder of Okthanks, a design partnership located in Lubbock, Texas. 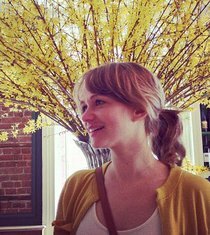 She holds a MFA in Interaction Design from the School of Visual Arts in New York, and a Masters of Architecture from Kansas State University and has over several years of experience working on web and mobile products.